With Cllr. Bernard Caldwell at the march. 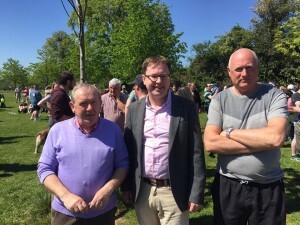 There was a big turn out for the march to save St. Catherine’s Park bordering Leixlip and Confey. The park sits between three local authority areas, namely Kildare, Fingal and South Dublin. This makes planning complicated and especially when one of those councils have put a line on a map indicating a potential road link through the park in future. People turned out today to show their support for the park and ensure that a road will not be welcomed cutting through the middle of it.